Punjabi Suit is an ensemble that People of Punjab and some Northern region wear also. With the time, Punjabi Suit becomes more popular not only in India but also in various part of the world as it gives complete freedom movement with maintaining the traditional look. Punjabi Suit is a common outfit in Punjab. Kameez is top and Salwar is bottom while Punjabi Suit is incomplete without a dupatta, its long fabric and use to cover the head. When flaunting a traditional look, it’s compulsory to carry chunni or dupatta in order to look outstanding. Designer not only come up with a vivacious pattern of Punjabi Salwar Suit but also combines it with different salwar pattern and it will give an absolutely stunning look as well as modernity. As Punjabi suits are puffy and give comfort, it can be wear in occasion or gathering functions. Generally, it suits to those people who are slim and tall girl/women. Have a look on some designer suits that would help you to choose the best for occasion or festival. Palazzo pants are very trendy at this moment and every ethnic store /Website has the latest collection of this year. The combination of Punjabi suit with Palazzo is really pop out. These pants look very sophisticated and are very comfortable also. Many palazzo pants are coming with different prints, fabric, and colors. It will be eye catching appearance if you wear high heels with Punjabi suit and Palazzo. Patiala Salwar is traditional to wear and generally, we match it with kurtas but in the trendy fashion world, it can be pair with a long top, tunic etc. For a festive look, wear Patiala Salwar Suit with heavy worked salwar or you can select golden shades that draw the attention of others. Brighter shades of gold catch the eyes with their brilliance that is perfect for festival and occasion. The importance of Ghaghara choli remains the same even after the arrival of latest patterns of the suit. Ghaghara choli consists three piece that is Ghaghra (full-length skirt), top and odhani or dupatta. Different draping styles of dupatta embellish and adorn the lady's look especially in function or occasion. Designer comes up with work like butta work, heavy border lace, resham embroidery, stone etc with different patterns and style to maintain traditional Punjabi look. Multi slit in suit provide an elegant look and this type of suit gives opening in the different side. Beige and pastel colors are new in the trend. There are many designs available with length cuts, stitching styles and floral prints but choose the best to have royal look. When women have worn frock style Punjabi suit, it will definitely change the look. This type of Punjabi suit is absolutely priceless. If you’re taller in height, this is the best option to choose kameez with frills and pleats with contrast color salwar. High heels and light jewelry adorn your look. People will surely ask you that from where you got such a beautiful frock style Punjabi suit if you buy from SareeO. Jackets give unique look to kameez. You can select long, light gray and gold heavy embroidery Punjabi salwar for cousin's wedding or night parties. For wedding purpose, you can wear closed jacket while open jacket with short top will stunning your look for night parties. Sharara is a bifurcated garment that looked like a skirt but fell straight. Sharara is a pair of wide legged pants and flare starts from the thigh. It’s looser and not ruched at the knee. Generally, it wears with long kameez. Yellow shades like mustard hand embroidered Punjabi sharara suit gives an attractive look. Slight variety is there in Patiala and Dhoti. In the event that you gaze part of the second, you will become more acquainted with. Not at all like Patiala, they don't assemble at the single base part yet is spread along its length. Designer beige color kameez with dhoti gives you traditional and festive look. Anarkali suits have "Kali" with the kameez and the "Kalis" are attached to the yoke of the kameez that is not available in Salwar Kameez. 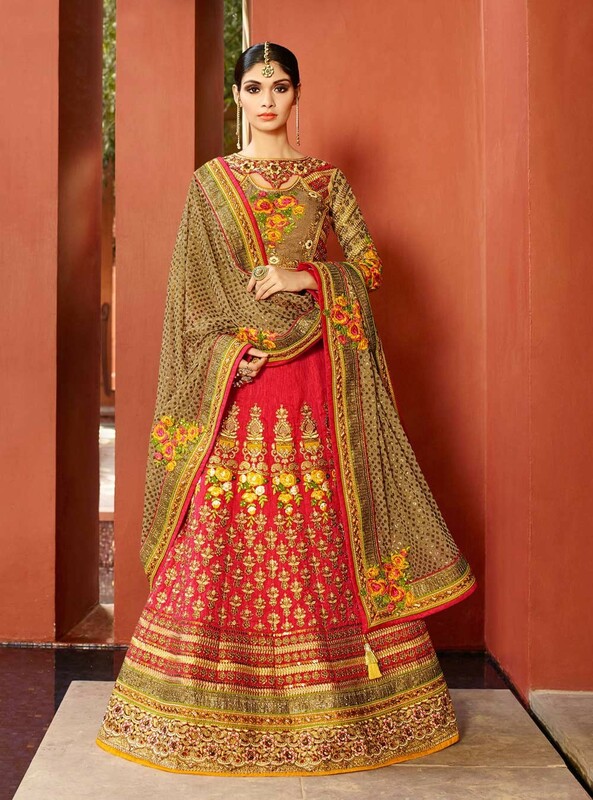 Anarkali's are usually occasional wear dress that gives you festive look. Long earrings and messy hairstyle will add the value. Embroidery worked Punjabi suit can wear in any function. They are made up of different material like cotton, silk, satin, georgette etc. which makes impressive festive wear suits. In order to augment the mesmerizing look of the dress, designers design it in different varieties that give pretty look. wow so beautiful all punjabi suit. but i very like Punjabi Sharara Suit. plz shar how to shop.